Around 245 million years ago the first dinosaurs appeared. This was during what geologists call the Triassic Period – the first period of the Mesozoic Era. Dinosaurs were reptiles and they had been preceded for millions of years by other reptiles on land. Conditions had allowed the survival of the larger reptiles, whose size helped them survive. These first dinosaurs were divided into various species. Wikipedia, under the heading "Triassic dinosaurs," lists more than fifty different species. Scientists describe them as having been as much as 10 meters long, including tail. They look like big lizards with large and powerful hind legs and weaker front legs about half as large. On the end of a long neck, their heads were made light in weight by large air spaces inside the skull. The Coelophysis dinosaur [image] had the small skull necessarily light in weight to accommodate a long neck. It had sharp teeth and is described as having eaten other reptiles and its own babies if there were a shortage of food. Epidexipteryx, pigeon-size dinosaur. Image from National Geographic, courtesy of Zhao Chuang and Xing Lida. 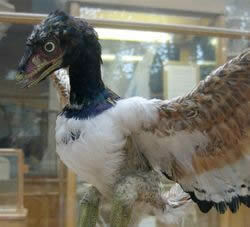 A model of Archaeopteryx, on display at the Oxford University Museum of Natural History. Among the creatures in the sea during the Triassic period was the reptile Ichthyosaur [image]. It looked something like a dolphin, was from 2 to 4 meters long, and is theorized to have evolved from land reptiles. And there were flying reptiles, Pterosaurs, not to be confused with dinosaurs or birds. Enter the middle period of the Mesozoic Era. In this period, land was breaking up into separate continents. There were new kinds of forests and all the plants that exist today. Species of dinosaurs had become extinct and new species had appeared. Among them was Dilophosaurus [image] which is estimated to have existed to about 194 million years ago. It is believed to have been about 20 feet in length and to have weighed about 1,000 pounds. Another species of dinosaur was Brachiosaurus [image], one of the biggest land animals yet found. It has been described as having been as tall as 52 feet and as eating herbs, leaves and fruits from the tops of trees. It is described as having existed as long ago as 156 million years and becoming extinct by 145 million years ago. Living between 155 to 150 million years ago was the bird-dinosaur, Archaeopteryx, which was the size of today's eagles. 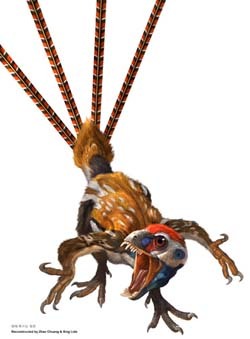 A BBC report by science writer Melissa Hogenboom on 1 August 2013 states, "Once regarded as a unique transition between dinosaurs and birds, scientists say Archaeopteryx has now lost its pivotal place." Birds are believed to have descended from dinosaurs. Birds share hundreds of unique skeletal features with dinosaurs. A study published in a July 2005 issue of the journal Nature suggests that dinosaurs had larger and more complex system of air sacs that are similar to that of today's birds. And it is thought that the empty space in dinosaur skulls, making the head lighter, may have contributed to an evolution toward the ability to fly. Hogenboom writes: "Bird brains tend to be more enlarged compared to their body size than reptiles, vital for providing the vision and coordination needed for flight." She writes that scientists using high resolution CT scans have found in many dinosaurs "the neurological hardwiring needed to take to the skies." These dinosaurs, included "several bird-like oviraptorosaurs and the troodontids Zanabazar junior, which had larger brains relative to body size than that of Archaeopteryx." The Cretaceous Period is the last of the three periods of the Mezoaic Era and is described as the last period with non-flying dinosaurs, a period ending 65.5 million years ago. During this period the continents had separated, but Australia and Antarctica were still joined. Each continent had its own flora and fauna. There were now flowering plants such as magnolias and waterlilies. Around 115 million years ago a bird-like creature with wings of skin rather than feathers, a pterosaur, was in the skies over what today is Brazil. It had a wingspan of five meters (16.4 feet) and when standing its shoulders were about one meter (39.37 inches) from the ground. Among the last of the non-flying dinosaurs was Tyrannosaurus Rex, or T-Rex as it has been called [image]. It is believed to have lived from approximately 68 to 65 million years ago. It was a villain in the science fiction movie Jurassic Park (although it was not of the Jurassic Period.) T-Rex was an aggressive flesh eater. In other words, a predator, as much as 43 feet long including tail, and 13 feet tall. In 2007 a team of scholars at Britain's Manchester University calculated that T-Rex had a top speed of around 18 miles per hour. A faster dinosaur is believed to have been Compsognathus of the Jurassic Period, at around 40mph – 5mph faster than today's ostrich. 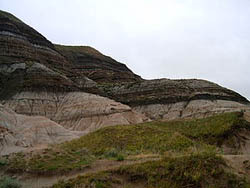 An example of the K-T boundary, appearing here horizontally at midpoint. Some scientists speculated that during the Cretaceous Period, Mesozoic Era, non-flying dinosaurs came to an end with what is described as an asteroid, at least 6 miles in diameter, crashing onto the earth, creating the 110-mile-wide Chicxulub crater near Mexico's Yucatan Peninsula. (See animation at Wikipedia under the heading "Chicxulub crater.") In 2014, scientists suspect there was a shower of asteroids rather than just one. The impacts threw enough debris into the atmosphere to block sunlight for months, and this was followed by lowered temperatures globally. Geologists have a boundary in earth layers which marks 65 million years ago, a boundary they label K-T. Above this layer-boundary no dinosaur fossils have been found. It is estimated that many land creatures failed to survive the K-T catastrophe into the new era, the Cenozoic Era, which extends 65 million years to today. Maybe some plant eating creatures died out because they lost their food supply, and maybe	this contributed to the deaths of carnivores dependent on them for food. Larger creatures were at a disadvantage in their need for more food and in having greater difficulty in finding or making shelter for themselves than did smaller creatures. There were small creatures that could burrow into the ground to protect themselves from the cold and from predators. Birds were likely to have a greater availability of food – in the form of insects, grubs and worms. All mammals have about 14,000 genes in common, and some species have additional genes close to that number that makes one species different from another.